to become “FIRST” in United States! 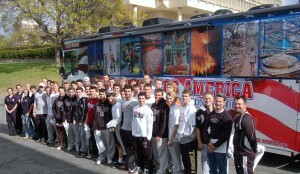 On Saturday October 16, 2010 the UMASS AMHERST Men’s Lacrosse team led by Head Coach Greg Cannella became the "FIRST" Division 1 College team in the United States to be certified in CPR and AED usage as part of the ATHLETES FOR AMERICA National Emergency Preparedness Initiative! Forty players and three coaches completed the two and a half hour life saving course and will receive their AHA certification cards. Congratulations Coach Cannella and your entire team! You are #1.